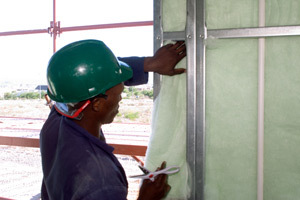 Wall Insulation by Isotherm saves energy and money. Energy-saving and maintenance-free, ISOTHERM in hollow structure walls regulates indoor temperatures, keeping homes warm in winter and cool in summer. 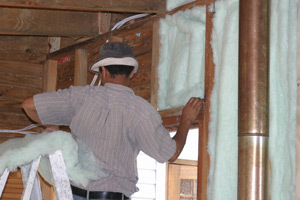 ISOTHERM Thermal Insulation is designed for application within hollow structure walls i.e. steel frame walls, timber walls and interior dry walls. ISOTHERM Thermal Insulation is easy and safe to install. ISOTHERM is supplied in rolls of either 750mm or 1200mm wide and is suitable for standard housing construction. Variable widths are available, but a minimum of 50mm is recommended. ISOTHERM will not sag in hollow wall frame structures. ISOTHERM is supplied in roll form; allowing you to cut to your customised size and shape. This is easily done by tearing or cutting with a pair of industrial scissors or shears. Measure correctly. Cut the ISOTHERM to size or slightly bigger than the frame size depending on the thickness of product used. ISOTHERM is available in 40, 50, 75 and 100mm. However, we recommend no less than 50mm for both exterior and interior walls. Position closely to the cladding material and ensure a snug fit. Position ISOTHERM behind cables, conduits and plug points, leaving them exposed. Do not waste off-cuts. Use them wisely by filling in gaps, crevices and corners. Cut the ISOTHERM to size or slightly bigger than the frame size depending on the thickness of product used. ISOTHERM is available in 40, 50, 75 and 100mm. However, we recommend no less than 50mm for exterior as well as interior walls. Position ISOTHERM correctly. Place in the vertical steel stud C profile frame positioned in closely to the cladding and ensure a snug fit. Ensure that the ISOTHERM is positioned behind cables, conduits and plug points, leaving them exposed. Variable widths are available, but a minimum of 50mm is recommended. Position ISOTHERM correctly. Position closely to the cladding and ensure a snug fit. Click here to download full installation guidelines.